The American sociologist Robert K. Merton has argued that science is underpinned by four moral elements: communalism (where scientists give up intellectual property rights in exchange for recognition and esteem), universalism (where truth is evaluated in terms of universal criteria), disinterestedness (where scientists are rewarded for acting in ways that appear to be selfless) and organized scepticism (where all ideas must be tested and are subject to rigorous, structured, community scrutiny) . To put it more simply, scientific advances involve sharing and peer review of research questions that have been objectively tested. Would Gandhi have been a Wikipedian? The Indian Express. 17 January 2012. http://www.indianexpress.com/news/would-gandhi-have-been-a-wikipedian/900506/0. Accessed 25 Apr 2015. Solomon DJ, Björk BC. Publication fees in open access publishing: sources of funding and factors influencing choice of journal. J Am Soc Information Sci Technol. Preprint. 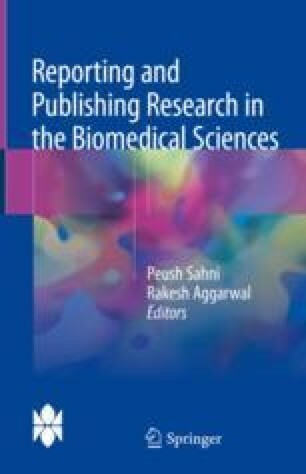 http://www.openaccesspublishing.org/apc/preprint.pdf. Accessed 25 Apr 2015. Mark Ware Consulting. Submission fees—a tool in the transition to open access? Summary of report to knowledge exchange. 2010. http://www.knowledge-exchange.info/default.aspx?id=413. Accessed on 25 Apr 2015. Suber P. Ensuring open access for publicly funded research. BMJ. 2012;345:e5184. https://doi.org/10.1136/bmj.e5184. Accessed 25 Apr 2015. Mukherjee B, Mal BK. India’s efforts in open access publishing. Library philosophy and practice. 2012. http://www.webpages.uidaho.edu/~mbolin/mukherjee-mal.htm. Accessed 25 Apr 2015. Lehman R, Loder E. Missing clinical trial data. BMJ. 2012;344:d8158. https://doi.org/10.1136/bmj.d8158. Accessed 25 Apr 2015. The Royal Society. Science as an open enterprise: open data for open science. 2012. http://royalsociety.org/uploadedFiles/Royal_Society_Content/policy/projects/sape/2012-06-20-SAOE.pdf. Accessed 25 Apr 2015. Hrynaszkiewicz I, Norton ML, Vickers AJ, Altman DG. Preparing raw clinical data for publication: guidance for journal editors, authors, and peer reviewers. BMJ. 2010;340:c181. https://doi.org/10.1136/bmj.c181. Accessed on 25 Apr 2015. Institute of Medicine. Sharing clinical trial data: maximizing benefits, minimizing risks. http://www.iom.nationalacademies.org/Reports/2015/Sharing-Clinical-Trial-Data.aspx.